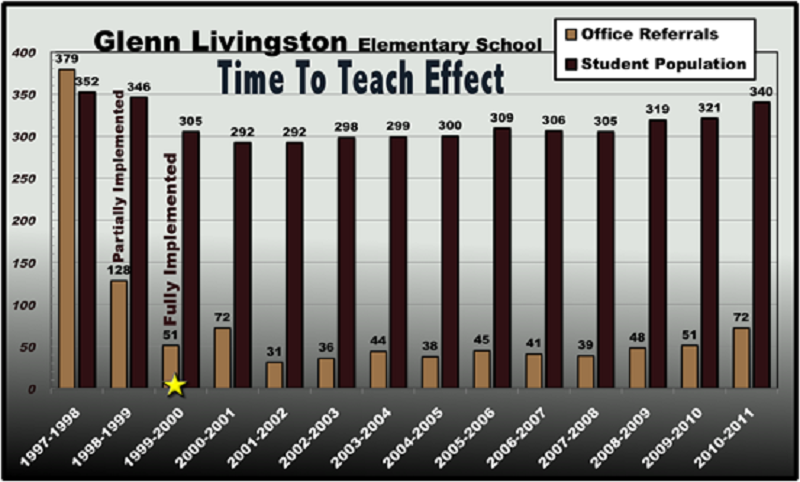 The Chart below demonstrates the drastic transformation in office referrals Time to Teach had on Livingston K-5th Grade Elementary School in Cody, Wyoming. 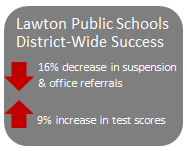 Even with a mid-year implementation you can see the dramatic effect and the ongoing benefits provided to this school. 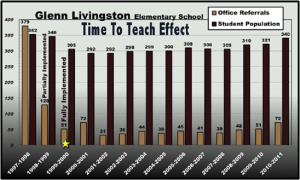 The first full-year of implementation of the teaching strategies resulted in only 51 referrals vs. the 379 referrals without Time to Teach strategies. 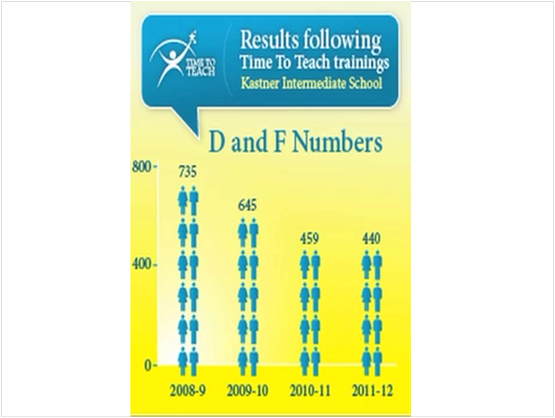 No more low-level referrals were sent because the teachers knew how to deal with them in the classroom. The principal and assistant principal had more time to deal with other educational matters. No longer was the office referral utilized for low-level behavior. The office staff enjoyed a calmer environment with only one child seen every three days rather than the two per day before. In-House Suspensions Cut in Half! Students in Special Education and Title Programs Achieve Grade Level Performance! Kastner Intermediate School Fresno, CA began “Time To Teach” by hosting a training in 2009. 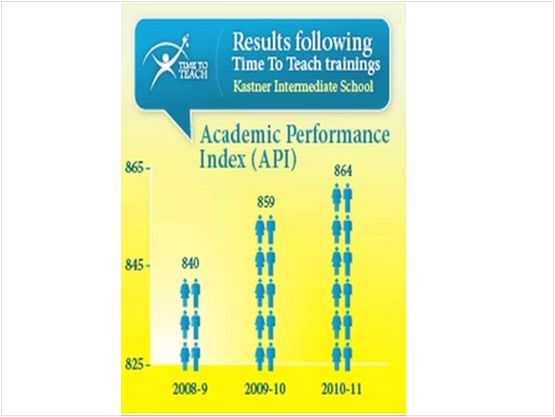 The following charts demonstrate the results following the “Time To Teach” training. 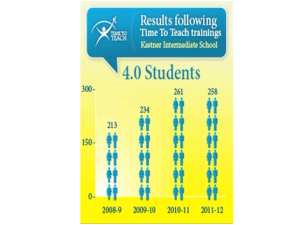 Kastner Intermediate School is a middle level school (Grades 7-8) with nearly 1,200 students . 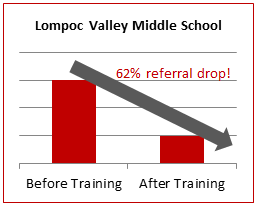 This chart demonstrates that the upper-end students are continuing to learn and be successful. The number of 4.0 students has risen from 213 in 2008-09 to 258 in 2011-2012. Attendance is up…..Academics are up. 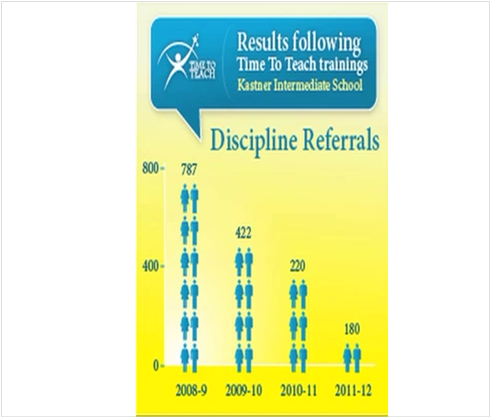 The number of discipline referrals decreased from 787 the first semester of 2008-09 to 180 for the first semester of the 2011-12 school year. Low-level discipline issues were being dealt with In the classroom and teachers and students were learning and following behavioral expectations. 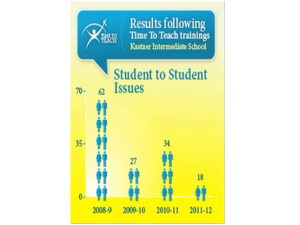 Student to student issues may include a number of items, including bullying, fighting, threats, etc.) In 2008-09 there were 62 reported student to student issues. In 2011-12 the number was 18. 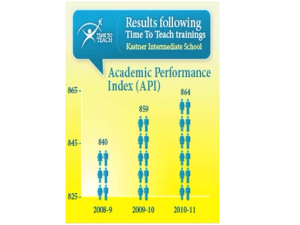 The Academic Performance Index (API), the state report card of California (a range of 200-1000 points), showed a gain of 24 points from 2008-09 to 2010-11.